Okay... I am completely psyched about the upcoming Royal Wedding. April 29th is booked off on my calendar and I am getting up early with a cup of tea and I'm going to watch it with the rest of the anglophiles out there. I have really fond memories of waking up early with my mom to watch Charles and Diana get married - it was like watching a story book - and I am eager to see what it's like watching a royal wedding as an adult. I am also acutely aware that this celebrity status we attribute to the royals causes a lot of trouble. Diana's death was tragic. So, there is a part of me that feels a bit guilty for taking part in this mass hysteria. Which is a good segue into what prompted me to write this short little post: The "Wills and Kate" side-by-side. Can you believe this!?? People will buy anything commemorative. 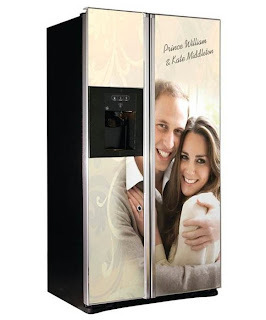 You can read the whole article about the launch of this fridge at Get Connected Magazine's website. I'm pretty sure Charles and Camilla picked something else as a wedding gift. Good Lord, what next - "Wills and Kate Commemorative Brickwork! Imagine driving home after a long day at work and seeing the royal lovebirds beaming at you in this larger-than-life image from the front of your house!"... Honestly!!! I however too have booked off April 29 and will be perched in front of my TV in my jammies to watch this magical day unfold. Yes I too think it's overkill but on the other hand I wouldn't mind getting my hands on a teacup, plate or tea towel with the happy couples image on it. If we are taking a poll as to who will be watching on the 29th. of April, count me in. I wouldn't miss it for the world, I'm a sucker for that stuff !!! what a hilarious souvenir! when is was in england over christmas i saw some pretty funny souvenirs. i am so excited for this wedding! will be right there with you on april 29th watching and wishing william and kate a life long love and friendship! This is probably one of the few things on which we disagree K-Girl- I have no time for the Royals whatsoever! However, I respect that other people will be drooling over themselves to get a good seat at their own TV to watch. I just won't be one of them. And yes I will watch post wedding clips so that I can see the outfits :). I am human after all! Monday Memories: Somethin' Wrong With Your Hand? I Want To Make Your Life Easier! Knolan: Son of Jor-El? Pavlov's Dog?